The World Genesis Foundation is a 501c3 not-for-profit organization dedicated to the mission to "leave no child without hope for the future." Our focus, apart from the alleviation of all kinds of suffering, is to create opportunities for the moral, physical and intellectual development of youth in areas of the world where opportunities are limited or do not exist today. 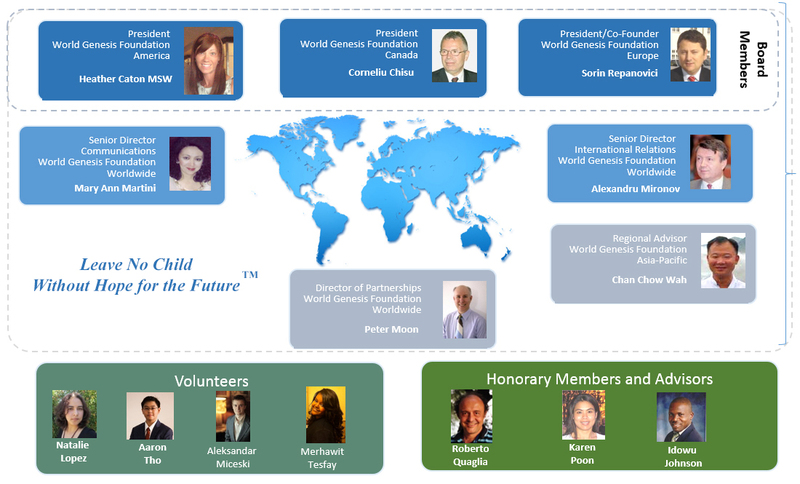 A Vision to "Leave No Child Without Hope for the Future"
The mission of the executive management team of the World Genesis Foundation is to proactively support and promote this vision within our charter. All decisions regarding development of the foundation and supported programs are made by this team that includes a Board of Directors and team of Senior Directors and Advisors. In addition to foundation projects our management team strives to identify and develop new partnerships to more quickly realize new opportunities for the development of opportunities for youth. If you have a suggestion, are interested to join us, or would simply like to learn more we would welcome you to contact us at any time. The World Genesis Foundation would like to thank and recognize the following organizations and individuals for their previous partnership and support of the mission to leave no child without hope for the future. THANK YOU FOR YOUR FRIENDSHIP, PARTNERSHIP AND SUPPORT!